Scottie's Transmission is a Complete Transmission Service Center in Amarillo, Texas! Scottie's Transmission can take care of your transmission needs at a price you can afford whether it's an older model car, a modern sports car, RV, or motorhome. Scottie's can perform Minor Adjustments to Major Repair on most any transmission. Scottie's specializes in transmissions to increase power, performance, and longevity! High Tech, Low Tech, or No Tech, Scottie's services all kinds of transmissions! Any Make or Model, All Wheel, Four Wheel, Front or Rear Wheel Drive - Scottie's knows transmissions! Scottie's Transmission is a Home Town Business with a NATIONWIDE WARRANTY! 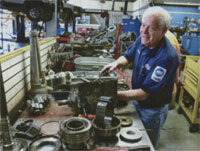 Scottie's Transmission stands for Old Time Quality and Service at Competitive Prices! Scottie's keeps pace with the Latest Technology and High Tech Equipment! Scottie's Educated Technicians are among the best in the business... They keep up to date on the latest transmission technology through continuing education and seminars! Quality is never an accident; It is always the result of high intention, sincere effort, intelligent direction, and skillful execution; It represents the wise choice of many alternatives.